This post is brought to you by my friends at Mighty Nest. I love this company because they sell only non-toxic items and donate a portion of all sales to local schools! When I first got into “detoxing,” my main focus was on cleaning up my diet. I think that tends to be the easiest place to start for most people, but after a while you start to realize how many other areas of your life you can detoxify, too– like your skincare routine, your makeup, your cleaning products, and the stuff you use in your laundry. I stopped using dryer sheets over 4 years ago, after realizing that they leave our clothes coated with a residue of perfumes and chemicals, some of which can be known carcinogens and neurotoxins. (You can see how different brands stack up using the EWG’s database.) The only reason these chemicals are currently allowed in cleaning products, such as shampoos, detergents, and dryer sheets, is because regulatory agencies assume that they won’t be absorbed by the skin and therefore aren’t being “consumed.” However, since we live in an era of birth control patches and nicotine patches, we know that things that come into contact with are skin are, in fact, quite effectively absorbed! The easiest way to avoid these added chemicals and fragrances is to simply stop using dryer sheets (and switch to a fragrance-free detergent). If you’re wondering what to use instead, I’ve got the perfect solution for you: dryer balls. 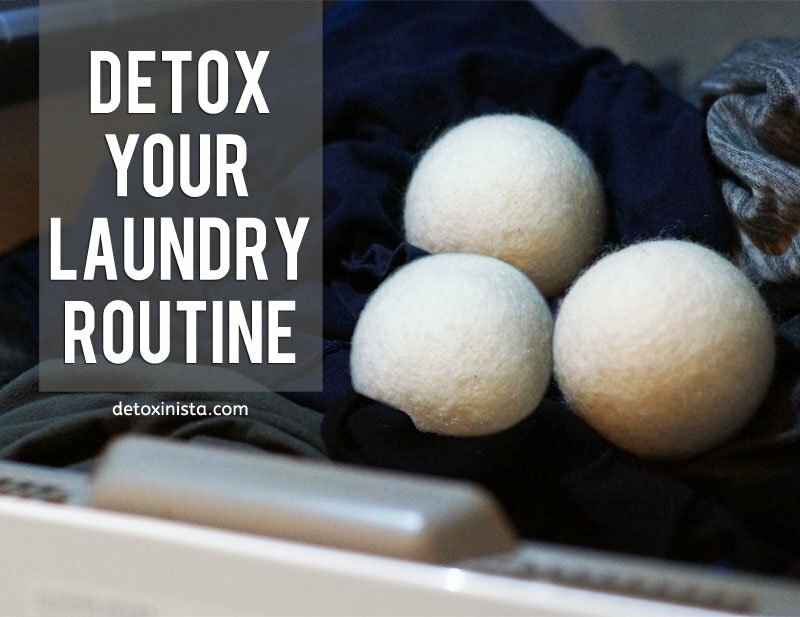 Dryer balls are an amazing alternative to dryer sheets because they not only soften your fabrics and reduce static, but they also shorten the drying time– making your laundry routine more eco-friendly. Plus, they’re not disposable like dryer sheets, so this one small investment (only $3 for my readers!) will last you for years. To get your set of dryer balls, simply sign up for the Mighty Fix program using this link or enter this promo code: DRYERDETOXFIX when you sign up for the Might Fix subscription service. When you sign up with this special promotion, you’ll pay only $3 for your first shipment, which will contain your new set of wool dryer balls. After that, Mighty Nest will send you a new non-toxic item each month for just $10, and the item will always be worth more than that. (And you can always cancel at anytime.) It’s like getting a surprise gift in your mailbox each month! Tip: If you miss the idea of scented laundry, simply add a few drops of your favorite essential oil to the dryer balls for a custom, non-toxic scent. Reader Feedback: Have you tried using dryer balls yet? If you have young kids, it may suddenly make them VERY interested in helping you with laundry– my son loves finding the balls as we’re folding our dry clothes! How many dryer balls do you in the dryer at one time? I usually use at least 3. We bought 6 of them, because sometimes they’ll get tangled up with the sheets and I won’t find them until I fold everything. Sometimes I’ll throw all 6 in the dryer if I have them all accounted for! 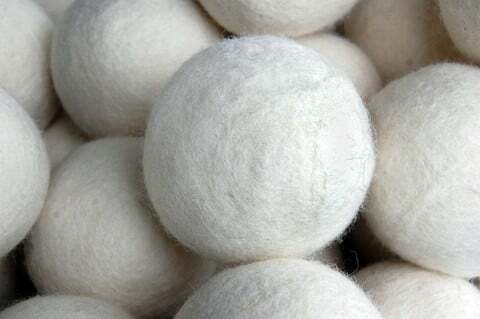 I’ve been using the wool dryer balls for a few years now and I think they are a great alternative to the chemical-laden dryer sheets. I put lavender oil on mine (a little goes a long way–don’t put too much on!). In my experience, the static is apparent when you first pull things out of the dryer but it doesn’t remain on the clothes for long. How about we all stop using dryers so much and start hanging our clothes again? Sorry, I’m from Europe, and one thing about the US that drives me crazy is how everyone’s routine is: washing machine-dryer. Even in hot climates! Hanging your clothes takes 5 minutes (I know how annoying it can be.. trust me! I do it -almost- everyday! It’s worth it though). It’s one simple step to saving lots of energy. Mother Earth needs you to do this. That is how it used to be done. And usually smelling great. However if someone has outdoor allergies they are usually advised not to hang clothes outside, especially in higher pollen times of the year. Nothing does smell quite as good though has items hung out to dry. ? I have horrible outdoor allergies, but always dry my clothes outdoors. Never made allergies any worse, and actually using soap nuts and drying on the line reduces my allergies. I do try to hang my things when it isnt raining. We have a lot of pollen in spring, too, so, have to wait that out, also. I hang some inside. Eve I am from the UK and love hanging out washing to dry however in the USA its not quite that simple. I lived in Nevada for a time and loved it, I could have a load of laundry out and dry before the next wash cycle was finished. I now live in the mid-west however and I can have a load of laundry out all day and it wont be dry. It may be hot but its exceptionally humid and your clothes just end up having to go into the dryer before they start to smell fusty. I do hang things up inside when I can but that also takes time and I cant do it with all the washing. We used to love hanging our clothes outdoors when we lived in the midwest US. Now we are in TX and find that many home owner associations ban hanging laundry outdoors even if out of view in your own back yard. What are everyone’s favorite essential oils to use for this? 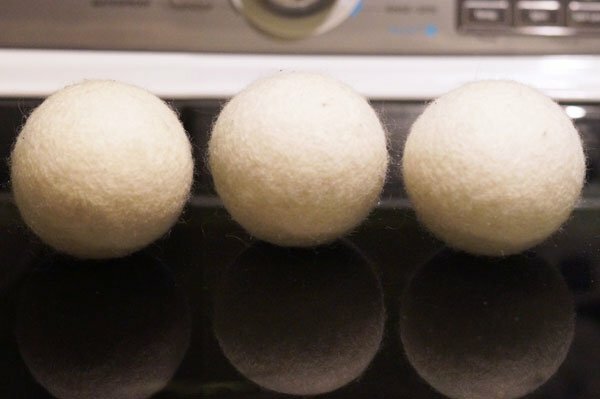 I bought organic wool dryer balls a few years ago in an attempt to ditch the dryer sheets. However, whenever I used the wool balls there would be a TON of static. I kept up with it for a few months despite the static, because everything I had read said the balls should actually help eliminate static. But it never got better and I eventually went back to the dryer sheets. Any ideas what I’m doing wrong that was causing all the static? I find that we have an issue with static if our clothes are “overcooked” in the dryer. The key is to run the dryer on the lowest heat allowed and for the least necessary time. The dryer balls help clothes dry quicker as well, so the cycle should be adjusted accordingly when one switches from dryer sheets. It takes some trial and error to figure out the necessary time depending on your dryer and what clothes you’re drying, but making sure that the dryer is running only as long as needed for the clothes to be just dry will greatly help to reduce the static. Very helpful tip. I posted my static issue earlier but my post was deleted. I wanted to love my wool dryer balls too but, in the winter especially, the static was too much to bear. I’ll try again! I love how in my family, everyone asks for these dryer balls for Christmas gifts! Never tried this specific brand before but I’m ready to give it a whirl. Will add those essential oils for the scent though. Chemicals are yucky!!! I’ve been using the regular rubber/vinyl(whatever they’re made of) dryer balls for years. I quit dryer sheets years ago after switching to a more natural diet. I then became sensitive to many things, including the dryer sheets. They no longer smelled like what they were chemically supposed to smell like. They smelled like chemicals to me. I’m definitely trying the wool ones. Thanks for the suggestion to put a drop of essential oils on them. Sadly my experience with wool laundry balls isn’t quite so positive. They did seem to reduce drying time but not by a significant amount. I found my clothes no more, but no less, soft than with dryer sheets. I live in the Mid-Atlantic which is quite humid during the summer when I first happen to make the switch. Then came winter when humidity dropped to ~20% (which is probably considered normal or even humid for some parts out West) and the static was too much to bear both from a clingy standpoint and a getting shocked standpoint. It was bad. Not only did they not reduce static, they made static worse. For a couple weeks I used nothing at all. Static was noticeably better but still not great. I had to break down and go back to my fragrance free dryer sheets. I continue my search for a much healthier laundry experience but for now, still rely on my fragrance free detergent and dryer sheets (at least until the humidity returns). I have the same issue with wool dryer balls. I wonder what could fix that. Have you tried attaching rust free safety pins, (1 to each ball)? I’ve read it takes the static right away! I use the wool dryer balls too and I currently live in the desert. I have to separate the fabrics based on the type so that the clothes dry at about the same rate. If I have things that are already dry with those that are not the fabrics rub together and create static. Also, over drying any fabrics will create more static with the dryer balls. I hope you will give the wool balls another try! Try throwing wadded up aluminum foil in the dryer. Hi Megan, I just tried to order the dryer balls and the website has an automatic $7.00 discount applied to first orders. During checkout, it shows the dryerdetoxfix code but it doesn’t bring the price down to 3.00. A $10.00 fee is added for initial sign up which is fine. (Granted, it could be due to user error -me). Any suggestions? I just clicked on the link myself, which takes you to the Mighty Fix sign up page. After you click the “sign up” button, it should take you to a checkout page– which does show the $10 fee on the right hand side, but if you scroll all the way down the page to the “Payment Information” it should show you that the $10 price has been reduced by $7, and the order total will only be $3. I hope that resolves any confusion, and let me know if you still can’t get it to work. I’m wondering if these wool dryer balls will be okay if I have a sensitivity to wool. I normally cannot wear wool clothing because my skin becomes irritated and itchy. Any thoughts?? I think you’ll be fine. I ger itchy from wool tool. It’s itchy to wear, but these will be felted and should be just fine. @Stephanie, yes, you’ll be FINE. The wool leaves NO residue, so even if you’re allergic to wool you don’t have to worry about a reaction! The balls don’t shed either, so you do t have to worry about something shedding onto your clothes and affecting you, either. IF the balls start coming apart or pilling too much put them in an old pair of nylons knot them between each ball and wash on a HOT cycle. And Dry on a HOT cycle–this re-felts the wool. ? I’ve had my set of six balls for six years!!! And I’ve only had to re-felt them once. They’re AMAZING!!! !